Jules Bianchi of France and Marussia walks across the paddock ahead of the Monaco Formula One Grand Prix at Circuit de Monaco on May 21, 2014 in Monte-Carlo, Monaco. Formula One driver Jules Bianchi has died in a French hospital from head injuries sustained in a crash at last year's Japanese Grand Prix. The Bianchi family announced the death in a statement issued in the early hours of Saturday morning. Bianchi had been in a coma since the Oct. 5 accident, in which he collided at high speed with a mobile crane which was being used to pick up another crashed car. The family statement said "Jules fought right to the very end, as he always did, but today his battle came to an end. The pain we feel is immense and indescribable." Bianchi competed in 34 races over the 2013 and 2014 seasons, scoring the first ever championship points for Manor — then known as Marussia — by finishing ninth at last year's Monaco Grand Prix. The Manor team tweeted: "We are devastated to lose Jules after such a hard-fought battle. It was a privilege to have him race for our team." Bianchi is the first driver to die of injuries sustained in an F1 race since three-time world champion Ayrton Senna was killed at the 1994 San Marino Grand Prix. "The world of motor sport is in mourning today," motorsports' governing body said in a statement. "Jean Todt, FIA President, expressed his deepest condolences to Jules' family and recognized the great pain being felt by the Bianchi family and those close to them." "We wish to thank the medical staff at Nice's CHU who looked after him with love and dedication," the family statement said. "We also thank the staff of the General Medical Center in the Mie Prefecture (Japan) who looked after Jules immediately after the accident, as well as all the other doctors who have been involved with his care over the past months. "Furthermore, we thank Jules' colleagues, friends, fans and everyone who has demonstrated their affection for him over these past months, which gave us great strength and helped us deal with such difficult times." Bianchi's accident occurred at the end of the race at the Suzuka circuit. In rainy, gloomy conditions, Bianchi's car slid off the track and ploughed into a crane picking up the Sauber of German driver Adrian Sutil, who had crashed out at the same spot one lap earlier. The section of the track where the accident occurred was subject to double yellow caution flags from race marshalls, due to Sutil's crash, but they failed to prevent a second accident. A working group of the FIA investigated the accident and found that as Bianchi went off track into the run-off area, he "applied both throttle and brake together, using both feet," over-riding the failsafe mechanism. His front wheels had also locked. It also said that Bianchi "did not slow sufficiently to avoid losing control." The findings of the working group prompted F1 to alter its rules, allowing a 'virtual safety car' in which stewards can neutralize a race, forcing all cars to proceed slowly into the pit lane rather than continuing to lap the circuit. The start times of some races were also moved forward to avoid them continuing in dim light conditions in a bid to prevent future tragedies. "Words cannot describe the enormous sadness within our team this morning, as we come to terms with losing Jules," said John Booth, team principal of the Manor Marussia team. "He has left an indelible mark on all our lives, and will forever be part of everything we have achieved, and everything we will strive for going forward." Current F1 drivers, many in the French motor racing world, and fans immediately began posting tributes and sympathy on social media. British driver Max Chilton, who was Bianchi's teammate at Marussia, tweeted: "No words can describe what his family and the sport have lost. All I can say (is) it was a pleasure knowing and racing you." Fellow French driver Romain Grosjean of the Lotus team said: "Yesterday we lost one of the best guys and best drivers I've ever met. I'll miss you so much my friend." 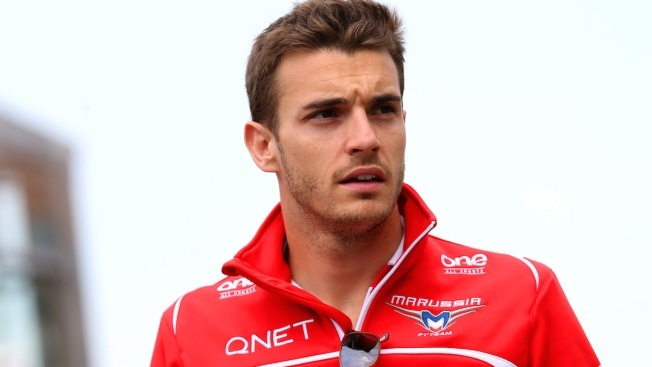 Bianchi's family had already lost a member in a crash. In 1969, Bianchi's great-uncle, Lucien Bianchi, died in an accident during testing at the Le Mans race track when he crashed his Alfa Romeo into a post, a year after winning the prestigious endurance race. They both had their best F1 races in Monaco, with Lucien Bianchi securing his only podium finish when he finished third there in 1968. In 2006, Bianchi became French karting champion, before graduating to drive in the Formula Renault 3.5 series and the GP2 series. Prior to his breakthrough year in F1, Bianchi drove for the Force India F1 team in several practice sessions during the 2012 season. Then, in 2013, he made his GP debut for Marussia at the season-opening Australian GP. In his next race, he placed 13th at the Malaysian GP — his best performance of the season, where he completed 16 of 19 races. Last year, with Fernando Alonso's future at Ferrari uncertain, Bianchi — whose grandfather Mauro Bianchi was also a racing driver — was touted as a future Ferrari driver, and declared that he was ready for such a challenge. His death came only days after Philippe Bianchi had said his son would not have wanted to go on living if he was severely disabled. "If he had a severe handicap, we are convinced that is not what Jules would want," Philippe Bianchi told France Info radio on Monday. "We talked about it. He discussed with us that, if one day he had an accident like that of Michael Schumacher, that even if his only handicap was not being able to drive, he would have a lot of difficulty living. Because it was his life."